Byzantine sculpture of Joshua receiving tribute from the Gibeonites, narrated in Joshua 9 - 11. This is the first climactic point of the book, where the Gibeonites are incorporated into Israel and defended from other Canaanites. The sculpture is made of ivory and reflects the prosperity and cultural renaissance of the Byzantine Empire during the 10th and 11th centuries. Photo credit: Metropolitan Museum of Art, public domain. 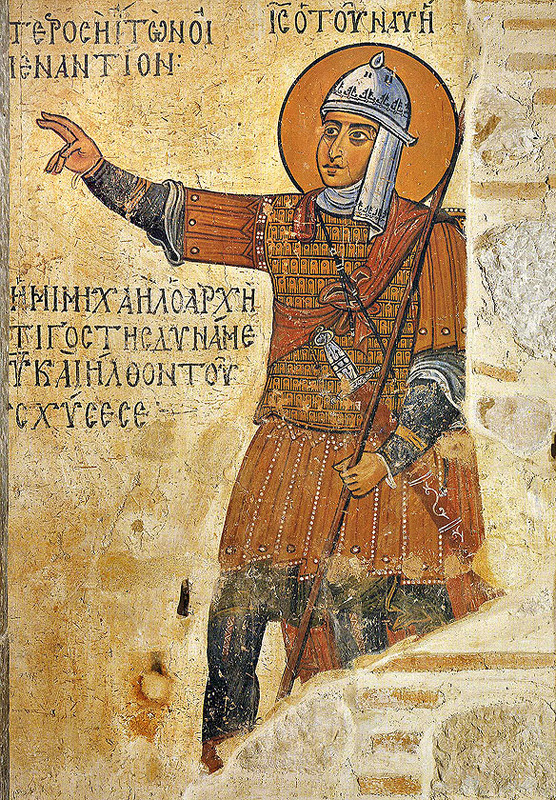 Wall fresco in the monastery Housios Loukas in Greece, of Joshua leading the battles of Israel into Canaan. The monastery was built in the 10th century and is believed to house the relics of the hermit Venerable St. Luke (not the biblical author). This was painted in the 12th to 13th centuries. Photo credit: Unknown, Wikimedia Commons.